The men were convicted of carrying out two attacks, including one during last year’s Formula 1 race. A Bahraini court sentenced five men to 15 years in prison for two attacks by homemade bombs – including one during last year’s Formula 1 race – the Gulf Arab state’s official BNA news agency said. BNA said the men had admitted being behind the bombings but an activist who monitors such cases said they pleaded not guilty to involvement in the attacks, which destroyed several vehicles but caused no injuries. Two of the defendants were tried in absentia. Bahrain, a Western ally which hosts the U.S. Fifth Fleet, has been in political turmoil since a 2011 uprising led by majority Shi’ites who demand more say in running the Kingdom, which is ruled by the Sunni Muslim al-Khalifa dynasty. The defendants were also convicted of a number of other counts relating to explosives, the agency said. Mohammed al-Maskati, head of the Bahrain Youth Society for Human Rights, told Reuters the men told the court their confessions during questioning were obtained under torture. The authorities were not immediately available for comment on that allegation but have said in the past that torture is not government policy. Widespread and excessive force, including confessions under torture, was detailed in a commission led by Cherif Bassiouni, a respected United Nations human rights lawyer, which published its findings and recommended measures to stop them. The Bahrain government says it has taken steps to address security forces brutality by dismissing those responsible and introducing cameras at police stations to monitor abuses. But activists say abuses continue. The authorities quelled the revolt in the island kingdom, which sits between Sunni-ruled Saudi Arabia and Washington’s main regional antagonist, Shi’ite power Iran. However, protests and small-scale clashes continue, and bomb attacks have been increasing since mid-2012. At least one policeman was killed and seven security officers were wounded by explosions and homemade bombs in recent months. 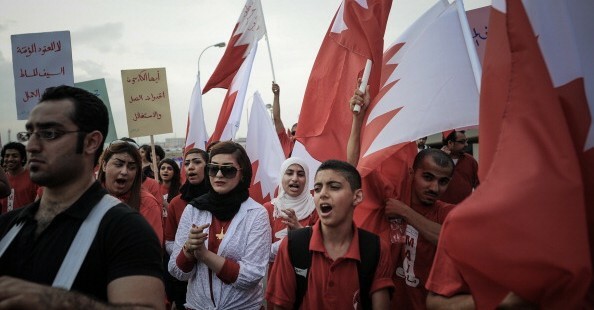 Bahraini Shi’ites complain of discrimination in areas such as jobs and public services – something the government denies. Talks between the government and opposition have failed to end the political crisis.